The worst part about being an obsessive music fan and a complete-ist is that unless you love every track on an album, the experience of listening to it seems to be a loss. 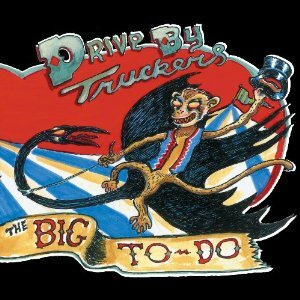 There is a lot to like about Drive-By Truckers’ The Big To-Do, but because I cannot get behind every song, I cannot get 100 percent behind the album. Call it a character flaw, because there is a lot to enjoy from DBT. The band’s alt-country sound has been refined and polished, which it should after the release of their 8,420,387th studio album.1 Their lyrics about hardship in small towns are well-written. The characters that inhabit their songs are fleshed out and I felt like I knew all of them personally. I care more about these tragic figures more than, say, a spurned lover in a Carrie Underwood song. But again, these are countered by some great stories with very quotable lyrics. The standoff and litany of excuses between Kim and Jimmy in “Get Downtown” are eerily similar to things I’ve heard people in my past say – it’s very easy to create your own roadblocks to getting a job. I feel for the child whose father passed away and his mother explained it away by saying “Daddy learned to fly” in the song by the same name. Musically there is something here for country and rock fans alike. This is a well rehearsed, well recorded, well written album. It has a feeling like listening to Bob Seger: just a meat and potatoes kind of rock and roll. As long as you don’t expect anything fancy, you will enjoy what you are being served. I felt lukewarm on The Big To-Do at first, but it is definitely growing on me. Greg and I normally don’t communicate our thoughts on the albums we reivew until after the reviews are posted, but we couldn’t help but talk about this one. Many of the grim lyrics left me feeling a little rough, and Greg countered how much he loved the lyrics and how they spoke to him. This is a great example of the subjectivity of music. Reviewing music is a sticky wicket, because even if someone loves an album that you don’t, they’re right for loving it. There’s a reason that album speaks to them: they have life experiences that make specific lyrics, certain harmonies or chords, special to them. It’s not my place to tell anyone that what they’re passionate about is not worth anyone else’s time. With that, I must say that I can’t give it an “if it were a tape, I’d have worn it out” status because the complete-ist in me can’t look past the couple songs that I’m still iffy about. But that is just my own mental block; I urge you to give The Big To-Do a listen and decide for yourself. Go do it. Like, right now. 1. They actually have 19 releases since 1996, so this is a number that was extrapolated utilizing a complex algorithm involving the year of the first release subtracted from this year, multiplied by the number of people in the band, divided by… where are you going? Come back! I’ll get back to the review, I swear!2. Hillbilly Noir: A term coined by Chris Mancini from Comedy Film Nerds for movies such as Winter’s Bone, which tell dark stories from small backwoods towns. I feel it applies here, too. This entry was posted in Reviews and tagged Drive-By Truckers, music, music review, nanobot rock, review, The Big To-Do by Clay. Bookmark the permalink.